The prewar Zeiss Ikon Nettax 35mm rangefinder, not to be confused with a postwar medium format camera of the same name. I've read several times that the timing couldn't have been worse for the arrival of the Zeiss Ikon Nettax, and history certainly could convince many people of that. One book has the Nettax being introduced in 1938, while other sources reference it as coming to market in 1936. I have a reproduction of the 1936 Zeiss Ikon catalogue, and it's not listed. However, I've seen a 1937 brochure that lists the Nettax alongside the Super Nettel. It's difficult to say with absolute certainty the exact year it was introduced, although the late 1930s is a safe estimate. As Germany ramped up its war effort, cameras definitely were not a priority. Increasingly, civilian production was being curtailed and/or diverted for military purposes, and that included the photographic industry -- a primary source for targeting scopes, binoculars and other optics for military use. The Nettax appears to have been the start of a lower-cost camera system. However, World War II stymied those plans. 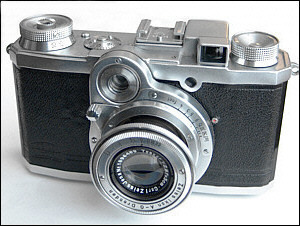 After the end of World War II, a number of Zeiss Ikon cameras did not return, and the Nettax was among that group. Much of that had to do with the destruction of Zeiss Ikon's facility in Dresden during Allied bombing raids. In any case, production of the Nettax lasted just a few years at the most. The Nettax appears to be an evolvement of the Super Nettel design. At first glance, you wouldn't think this to be true, because the Nettax appears to be a different camera from the folding Super Nettel. But a close inspection of the two shows that both cameras are nearly identical with the exception of the lens mount. 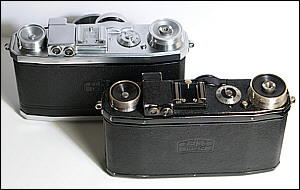 Zeiss Ikon's Nettax, rear, and Super Nettel. 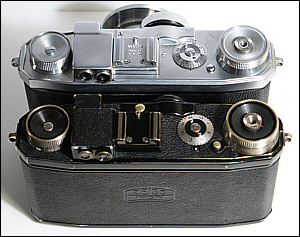 Notice how Zeiss Ikon built this camera using the same body shell. Note the identical shape of the top deck and layout of controls. The only difference is the color of the body and the change to satin chrome for the Nettax from leather coverings and brass on the Super Nettel. You can really see how identical the cameras are in this comparison. Whereas the Super Nettel is a fixed-lens folding camera, the Nettax is a rigid-front design that offers interchangeable lenses. The rest of the camera -- the body shape, physical dimensions and layout of controls, dual eyepieces, accessory shoe and rangefinder windows -- is shared by both the Super Nettel and the Nettax. Mechanically, they both use the Contax's vertically traveling brass shutter with a mechanical retard for the slower speeds. The Nettax, like the Super Nettel, was produced under the direction of Hubert Nerwin, Zeiss Ikon's brilliant and innovative designer. [Read more about Hubert Nerwin on the Zeiss Historica Web site.] The Nettax shows Nerwin's hand in the design with its sculpted corners and gentle curve for the secondary rangefinder window and its clean and efficient design. The Nettax continues the Super Nettel's setup of using two viewfinders -- one for focusing and one for composing. It's a minor nuisance. The photographer only has to shift his eye slightly to the left after focusing. The Nettax is solid without being overly heavy. Oddly enough, most of the camera's weight is in the lens assembly, which also holds the focusing mechanism and rangefinder components. Like the Contax II, the Nettax uses a lift-and-turn shutter speed selector, which also advances the film and tensions the shutter. The shutter release is centered inside the film advance knob, and the frame counter (similar to that used on the Contax I) is simple to use and set. Shutter speeds run from 1/5 to 1/1000 plus B. Like the Contax II and Super Nettel, pushing the shutter release fully in and turning will lock the shutter open on the B setting. To rewind the film, press and hold the small silver button just below the frame counter dial while turning the film rewind knob. Like the Super Nettel, the viewfinder impedes the rewind action, so it will take you a l-o-n-g time to rewind a roll of 36. The Nettax accepts Zeiss Ikon reloadable cartidges, and by using either one or two, you don't have to worry about rewinding. In any case, operating the camera is very easy. 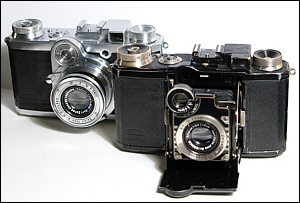 The Nettax offered two standard 5cm Carl Zeiss Jena Tessars: an f/3.5 and for those wanting a bit more speed, an f/2.8. These appear to be the same collapsible Tessars that were made for the Contax and were thus refitted to the Nettax mount. I think an enterprising person wouldn't have too much difficulty refitting a collapsible f/2.0 Sonnar to the Nettax mount. I've read two reports on other lenses. One report said there was a 7.5cm Triotar, while another said it was a 10.5cm Triotar. The one report also said there was an f/8 2.8cm Tessar -- which would be the same Tessar from the Contax lineup. The 7.5cm lens occasionally shows up in online auctions, and price usually is close to $1,000. 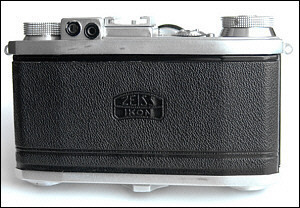 The back is removable, as was normal for Zeiss Ikon's 35mm cameras, being touted as making it easier to load the film and clean the inside of the camera. As always, photographers were advised to frequently inspect the inside of their cameras for film chips that are broken off by the sprocket wheel. It's still good advice today. Like the Super Nettel, the Nettax is a right-hand focus camera. You can use your middle finger to focus the Tessar by pushing down or pulling up the small protruding post. Your left hand has even less to do, so just use it to keep a firm grip on the body. I've been wanting to buy a Nettax for some time, but its limited production run means there weren't many produced. Today, limited production means a higher price. Finding one for a "reasonable" amount was even more difficult. This particular camera came from Texas, but I don't know anything about its background. It was last serviced in 1965. I believe the shutter straps were replaced at that time, because the stitching appears to be new -- well, newer than the late 1930s -- and the straps seem very durable. I was happy to see that. Replacing the straps isn't difficult; it's just a pain. The Nettax shares the same body shell as the Super Nettel, and I think Zeiss Ikon came up with a potential winner with the Nettax. It's definitely heavier, owing to the weight of the Tessar lens barrel and mount. The camera feels nicely balanced in my hands, and the controls seem to be in logical positions, except for the focusing post, which you move with the index and/or ring finger of your right hand. I've never been a fan of tabbed focusing, whether it be a Konica I, II or III, a Leica or the Nettax. The protruding post moves through a roughly 60-degree arc from infinity to its closest distance of about 3 feet. There is a small -- and I mean small -- depth of field scale engraved on the face plate of the focusing ring. Using two viewfinder windows isn't that difficult. Obviously, one is better, but the close proximity of both peep viewfinders is easy enough to handle. What will pose a problem for eyeglass wearers is that the openings of both eyepieces is very tiny. But that's been a problem for eyeglass wearers for some time with the classic cameras. To remove the lens, press the Contax-style tab and twist the lens roughly an eight of a turn to the left. It doesn't matter if the lens is extended or collapsed. I only have one lens -- the uncoated f/2.8 5cm Tessar. When reattaching the lens, the job is much easier if you depress and hold the tab. The lens locks into place with an audible click. It's a very simple and secure system. There are Contameter + Proxar closeup sets for the Super Nettel, and I see no reason why these wouldn't work with the Nettax, because all of the optical systems and physical dimensions are identical, including filter sizes for both cameras. Like nearly all Zeiss Ikon cameras, design, quality of construction, choice of materials and attention to detail are impeccable. Even nearly 70 years later, the shutter runs accurately and the lens helical focuses smoothly. I wonder what the Nettax might have been if it had been fully developed. The Nettax is different from a Contax II in that you must remove the lens panel in order to completely remove the top deck. With the Contax II, once you remove the film advance knob, you then remove the inner parts of the assembly, which allows you to remove the shutter speed indicator ring. That isn't possible with the Nettax. In order to remove the inner parts of the film advance, you must remove a pin from the underside of the shutter release. Only then can you remove the shutter speed indicator ring, which then allows you to fully remove the top deck. But to get to this part, you have to pull the lens panel, which requires you to remove the front leather. And in order to remove the lens panel, you also have to remove the bottom plate under the shutter assembly. It's held on by four flat-headed screws. Remove the front leather by carefully lifting one corner. Then using a flat instrument, such as a metal fingernail file, pull the leather from the body while using your tool to help "slice" it from the body. There is a thin brass leaf that covers an inverted "L" slot. Remember to clean it and put it aside for replacing later. The lens panel is held by four screws, which are sunk slightly below the surface. The screw holes might be filled with a black wax, which comes out easily. The lens panel simply lifts away from the body. Note that in order to remove the top deck, you also have to remove one screw in each film chamber, in addition to the neck strap eyelets, as well as the film counter dial and the single screw in front of the accessory shoe. It's not necessary to remove the accessory shoe. Inside the film chamber, there are two screws on the takeup side; remove the one that is near the outer edge of the camera. Leave alone the screw that is next to the shutter. Now, that wasn't so complicated, was it? Replacing those pesky shutter straps is fairly straightforward. There is a thin baffle that needs to be removed, but there are otherwise no other surprises.